I think we may be done ...maybe. Alley started having her babies around 3 this afternoon and they are all just beautiful! It has been a day full of fun! Maybe not for Alley but she is already in love with her babies. So far she has been a wonderful Momma. I plan on sleeping close by to the sound of sweet puppy grunts...awwww. but it will have to wait. I have 9 puppies to love on. oh, puppy breath,,,the best!! oh if I were your neighbor I would probably be there too. Oh, this is the best!! I haven't seen this since my little dog from long ago (Sheba) gave birth to 8 pups. It was an awesome experience!! Oh, babies. I love babies. I wish I was close and could come hear them grunt. Have a good night and enjoy the love. I love tiny pups with their eyes still closed - they can find Mommy, though. Cuteness! Congrats on the new addition to your family. Hope you and the new mommy sleep well. Congratulations on the newest family members! So adorable and every different color too! It's nice that she had them at 3 in the afternoon and not 3 in the morning! those puppies look precious! lucky that you get to love on them. who could resist a laundry room full of sweet puppy love. Adorable! Enjoy the early days with these beautiful pups! OMG! I love it...did you mean to get her pregnant? I have thought about breeding our Golden Retriever...:)Is it hard? Awww, look at all those nursing puppies!! Awwww....!! I have 2 female labs and just adore them. Congrats on your new additions!! How adorable is that! Sweet little squirmy puppies! Congrats to all! OMGosh...9 puppies! I would be in heaven...and I don't care what anyone thinks, I love puppy breath! Look at that beautiful momma with those adorable babies. Could anything be more sweet? What gorgeous pictures of adorable puppies! What a bunch of tiny little miracles! congratulations! 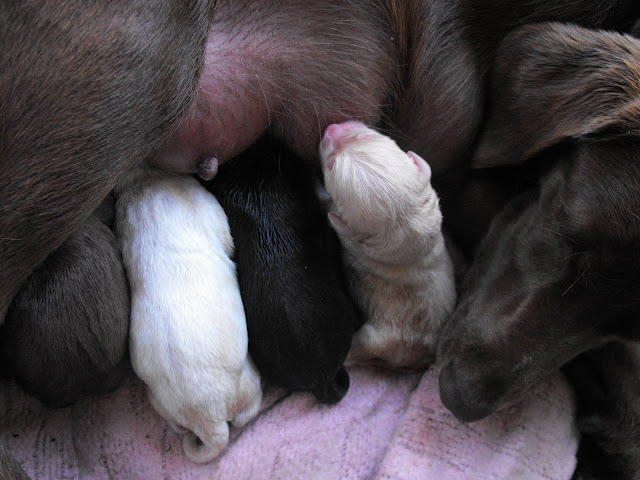 what a good mama...those puppies look like heaven! So sweet!! You are going to be busy with all those cute puppies! ps...I'd like the little white one please! They are so sweet ~ hope you got a little sleep last night. Are you enjoying the book? I'm SO glad you posted about it. She is a fabulous author and I can't wait to look into a few of her other books. Oh such precious pictures! thanks for sharing! Absolutely precious!!! Say goodbye to your clean laundry room! Call me sometime! Those puppies are going to be ridiculously adorable! :) Hope the momma is holding up. She must be exhausted. Oh, Susieness. Nothing sweeter. How precious! Have fun with pretty momma and babies! Oh, could they be any cuter? I miss the puppy stage. Our corgi turned 1 in November. He is still a puppy because he bites on everything but he is almost 40 pounds! I showed my 2 year old and he said "oh my puppies! Can we bring them home?" not on your life buster! 1 dog is enough for us right now! I luv it when the big guy upstairs shows off a lil and brings in new life. Congrats to u and Ally! Ohhhhh, how wonderful! She looks like such a happy mama! Wow~ 9 is a bunch huh? Have fun with those little cuties! Absolutely adorable - sweet, sweet, sweet! So precious. We have an unneutered yorkie. We didn't intend for him to remain unneutered but when he went into to be "fixed", he went into cardiac arrest under anesthesia. We were lucky they brought him back to life. So, we opted not to put him through the process again. We have discussed bringing another female yorkie into our home (after our oldest yorkie, 16, passes away) and breeding the two, but my husband says that if they have puppies, we should be prepared to keep them all because he won't be able to separate them! My husband is such a softie! LOL! Precious! I want to see more pics. i'm not really a dog person, but who could resist those babies?! wow. nine. such cuties! So sweet! I hope you keep us updated with lots of pictures! 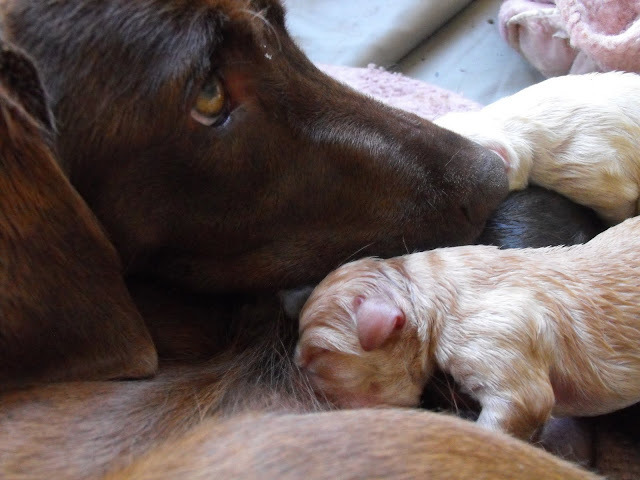 We had the opportunity to foster a mother dog and her 9 pups last year. It was really a great experience! We kept one of the puppies but I grew really attached to all of them. It was bitter sweet to see them go. I have pictures of them on my blog (under the lable puppies) if you'd like to see the pictures. Hope you all are having fun with yours and best of luck to you! Oh, hold one up and let him snuffle in your ear, please! I love that. It's been way too long since a puppy snuffled in my ear. Hey Susie,, those puppies are just sooo cute... Cant wait to see the mirror you make. I literally found myself saying "Ohhhh. . ." out loud as I looked as these photos. I'm not sure there's anything in this life--aside from my own babies--that captivates my heart as much as puppies. You're lucky I don't live closer to you. . . you'd have to run me out of your laundry room! Aww...lots of sweet puppy breath!! Oh my stars! How precious! My cocker spaniel had 9 puppies. Her one and only litter. She was NOT a good mama! Good thing for her, I was! Sooooo cute! Congrats to you and Alley! Too cute! Congrats on your puppies. Are you keeping any? How could you not!! i have a choc lab too. They're just the best! They are adorable! I am just catching up with my blog reading. How can anyone not smile when they see this? What sweet little puppies. Mama looks a little tuckered out. Hope all is well with these little pups. To cute! I have a lab that is blonde...is Alley a lab?..she sort of looks like one. They are precious! I just found your blog today and I love it!